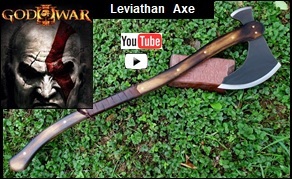 Leviathan Axe – Influenced from the Game God of War - See Pictures, Prices, and Descriptions. Made by Scorpion Swords & Knives. This two handed war axe is the signature weapon for Kratos in the game God of War. Used for slicing and dicing through hordes of enemies. At range, the Leviathan Axe can be thrown with great force at opponents even at a distance. The axe is brutal and resourceful. Total Length = 36 " Blade Length = 9 " Blade Width = 6 "
Blade Thickness = 3/16 " Handle Length = 33" Handle Width = 1 ½ "